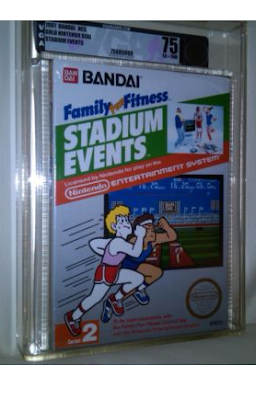 There is another NTSC version of Family Fun Fitness Stadium Events up for sale but this time it has a low starting bid of $9.99 and no reserve. Bidding is up to $15,000 as I write this article. Hopefully the high bidder actually pays for the auction this time. The last two sales in September and June 2011 were from the same seller with the same game, which leads me to think they didn't complete the previous transactions. It'll be interesting to see what the true value of a sealed Stadium Events is - excluding joke bids and Stadium Events Mania like the last ones. Why are there so many sealed copies of this game anyway? I feel like there's been too many for its alleged rarity. The mania obviously drew them out of the woodwork, but three in three years seems like a lot. This is just speculation, but I think sealed copies make sense considering why its rare--it was recalled. So with so few of the copies being sold, it makes sense the rest would just stay sealed in a warehouse somewhere. That being said, i'm always suspicious of resealing. Some of these auctions were for the same exact game just resold. So it wasn't more copies of the game, but someone who bought the game and then resold it.